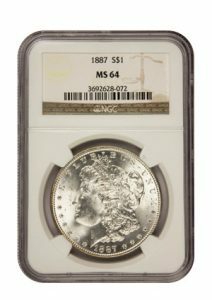 The Morgan Silver Dollar was first struck in 1878 out of need to absorb the quantity of silver mined from the Comstock Lode. 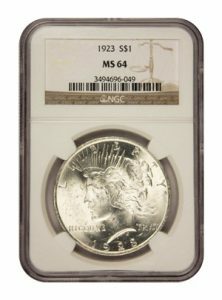 Designed by George T. Morgan, this coin proves to be one of the most collected silver coins in our history. Morgan studied under the direction of instructors from the Royal Mint in London. To lay claim to the design of this coin, he placed an ‘M’ on both sides. However, when the coin was reintroduced in 1921, Morgan made slight revisions to the design. 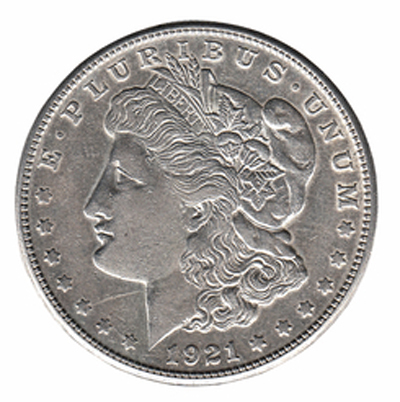 The Morgan Silver Dollar was the largest and heaviest silver coin since the Civil War. It was minted from 1878 to 1904, at which time the government exhausted its supply of silver bullion. In 1918 Congress passed the Pittman Act, which recalled over 270 million silver dollars for melting. 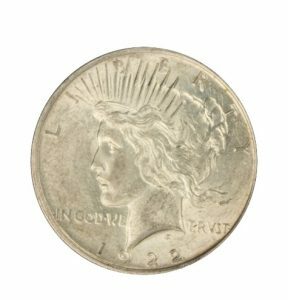 The Morgan dollar was minted one last year, in 1921, before it was replaced by the Peace Silver Dollar. The obverse (front) of this silver coin primarily features the head of Lady Liberty. She is encircled by 13 stars, the date of issue, and the words ‘E PLURIBUS UNUM’ (Out of many, one). The reverse (back) depicts a bald eagle with wings spread perched upon a branch and arrows. Around the eagle is the motto ‘In God we trust’ and a wreath with the rim of the coin featuring the words ‘UNITED STATES OF AMERICA’ and ‘ONE DOLLAR’ separated by stars.